SAINT™ delivery technology is based on a set of proprietary, entirely synthetic, cationic lipid structures which have demonstrated to be safe and non-toxic both in vitro and in vivo. Due to its cationic headgroup and amphiphilic nature, SAINT lipids readily bind to most biomolecules (DNA, RNA, and protein) and to cellular membranes, facilitating efficient uptake and release of these biomolecules inside cells. 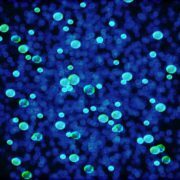 SAINT lipids have demonstrated to reach similar or much higher transfection efficiencies (depending on the cell type) than competing, well-known products for a fraction of the price. Find your application and product of interest below. 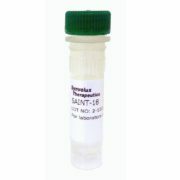 SAINT-DNA is ideal for in vitro transfection of most cell lines with plasmid DNA. No special transfection media required, no need to remove serum or antibiotics, just mix & go. 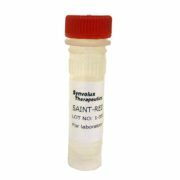 SAINT-sRNA is an optimized formulation of Saint-Red and is used for in vitro transfection of cell lines with small RNA, such as siRNA and miRNA mimics and inhibitors. SAINT-sRNA is serum compatible and suitable for high throughput screening. 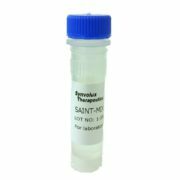 SAINT-mRNA is a new product, optimized for in vitro transfection of cell lines with mRNA. Guaranteed free of RNase-activity, extremely simple and fast transfection protocol, resulting in > 95% transfection efficiency in selected cell lines. 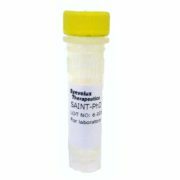 SAINT-Protein is an updated version of Saint-PhD which was developed specifically for transfection of protein and peptides into cells. 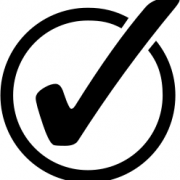 It may be used for e.g. testing of bio-active peptides or for transfection of enzymes (e.g. DNA-modifying such as Crispr-Cas or methylases), antibodies, and protein fractions. Suitable for high throughput screening. SAINT-O-Somes are custom liposomal formulations that deliver their cargo (e.g. siRNA) to specific cells or tissues through targeting moieties such as antibodies, ligands, or peptides. Due to their unique, heat-stabile properties and optimized synthesis and production-process, Synvolux can offer cost-effective, GMP-grade transfection reagents for clinical studies. SAINT-Vivo has proven to be an ideal delivery vehicle for in vivo applications, such as transgenic gene expression, and protein- or DNA-based vaccines.